We all want our home appliances to be controlled automatically based on some conditions and that's called Home automation. Today we are going to control the light based of darkness outside, the light turns ON automatically when it is dark outside and turns off when it gets bright. For this, we need a light sensor to detect the light condition and some circuitry to control the Light sensor. It’s like Dark and light Detector circuit but this time we are using Arduino to get more control over light. In this circuit, we are making a Light Sensor using LDR with Arduino to control a bulb/CFL as per light condition of the room or outside area. LDR is Light Dependent Resistor. LDRs are made from semiconductor materials to enable them to have their light-sensitive properties. There are many types but one material is popular and it is cadmium sulfide (CdS). These LDRs or PHOTO RESISTORS works on the principle of “Photo Conductivity”. Now what this principle says is, whenever light falls on the surface of the LDR (in this case) the conductance of the element increases or in other words, the resistance of the LDR falls when the light falls on the surface of the LDR. This property of the decrease in resistance for the LDR is achieved because it is a property of semiconductor material used on the surface. We previously made many Circuits using LDR, which use LDR to automate the lights according to requirement. As per the circuit diagram, we have made a voltage divider circuit using LDR and 100k resistor. The voltage divider output is feed to the analog pin of the Arduino. 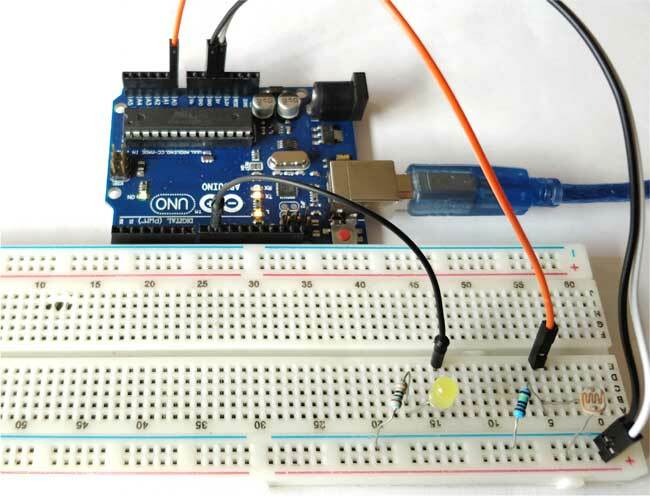 The analog Pin senses the voltage and gives some analog value to Arduino. The analog value changes according to the resistance of LDR. So, as the light falls on the LDR the resistance of it get decreased and hence the voltage value increase. As per the Arduino code, if the analog value falls below 700 we consider it as dark and the light turns ON. If the value comes above 700 we consider it as bright and the light turns OFF. Complete Arduino Code and Demonstration Video is given at the end of this project. Here, we are defining the Pins for Relay, LED and LDR. Setting up the LED and Relay as Output pin, and LDR as input pin. Reading the voltage analog value through the A0 pin of the Arduino. This analog Voltage will be increased or decreased according to the resistance of LDR. Giving the condition for dark and bright. If the value is less than 700 then it is dark and the LED or Light turns ON. If the value is greater than 700 then it is bright and the LED or light turns OFF. Instead of controlling an LED according to the brightness and darkness, we can control our home lights or any electrical equipment. All we have to do is connect a relay module and set the parameter to turn ON and OFF the any AC appliance according to the intensity of the light. If the value falls below 700, which means it Dark, then the relay operates and the lights turns ON. If the value is greater than 700, which means its day or bright, then the relay will not operate and the lights remain OFF. Learn more about relay here and how to connect an AC appliance to relay.